Dacia barely resembles the ailing company that Renault acquired for $50 million in 1999. Dacia, Renault's budget Romanian brand, hasn't introduced a truly new car since 2012. Its stripped-down vehicles don't have the latest driver-assistance features or safety aids. And, you won't hear about advances in connectivity or the virtues of electric or hybrid drivetrains from a Dacia owner. Yet the brand continues to set annual sales records. It has also become a pillar of Renault Group's growth and profitability. Dacia is on track to sell 700,000 cars globally this year (including about 550,000 in Europe), compared with about 250,000 in 2008. 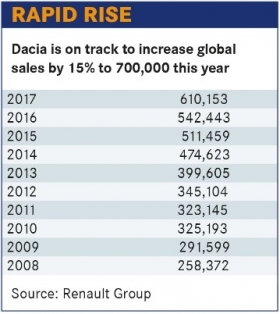 Hundreds of thousands of Dacias are also sold as Renaults in markets outside of Europe including Latin America, Russia, Africa and the Middle East. Renault executives say the formula is simple: Use only existing technology and keep the option list short, avoid profit-sapping incentives and non-retail sales channels, and build customer loyalty in unconventional ways without expensive marketing campaigns. Dacia sales grew by 16 percent in Europe in the first half, following the introduction of the redesigned Duster small SUV. But sales also increased measurably for the compact Sandero hatchback and Dokker van. The explanation, said Sylvain Coursimault, the head of sales and marketing for Dacia and Renault's Global Access range, is that a second generation of Dacia buyers is emerging. "Starting in 2015, we had the first renewals for Dacia buyers," Coursimault said, meaning that customers who bought the first modern Dacias under Renault's stewardship – starting with the Logan introduced at the end of 2004 – had decided to buy another. At the same time, Dacia continues to draw a significant percentage of buyers from the used-car market. According to Coursimault, 55 percent of Dacia buyers now stick with the brand when they buy another car. About 10 percent are coming from Renault and the rest are moving on from used cars or another brand. Within Dacia, some Logan and Sandero owners are moving to the more expensive Duster; and Coursimault noted that the brand has become a "significant bridge" to Renault models. "Shockingly affordable" is how Francois Mariotte, commercial director for Dacia until his recent promotion to head of Renault in Ukraine, described Dacia prices. Even now, the Logan starts at 7,790 euros in France, and the new Duster at 11,990 euros, unchanged from the previous generation. "It's the 'smart buy' phenomenon," Coursimault said, comparing Dacia to budget brands such as Lidl, H&M and Ryanair. "Cars are getting heavier, more powerful and more expensive. Dacia's position is counter to those trends." Costs are kept in check by parts sharing (the doors of the new Duster are the same as the previous-generation Logan, for example) as well as low-cost manufacturing in Romania, Morocco, South America and elsewhere. Profits are buoyed by avoiding rental sales channels and incentives. "We don’t push cars on customers" by discounting, said Coursimault, who spoke with Automotive News Europe during a recent visit to Renault's facilities in Romania. "Instead, we prefer a 'pull' system that draws customers to the brand by creating a loyal following." One way Dacia has done this is through its annual picnics for owners. This year's French picnic, held in July, drew 10,000 people for free entertainment, amusements and food – and test drives of new models. Today, Dacia barely resembles the ailing company that the Renault Group acquired for just $50 million in 1999. At the time, Dacia was undercapitalized, suffering from quality issues and still selling cars based on the Renault 12, which was first built under license in 1969. Still, Louis Schweitzer, Renault's CEO at the time, saw an opportunity for Dacia to be the French company's bridge to internationalization, one of his goals after losing a bid for Skoda to the Volkswagen Group in 1992. Schweitzer's vision of a 5,000-euro car that would be "modern, robust and affordable" became the Logan, introduced in late 2004 in Eastern Europe. However, the Logan became a surprise hit in Western Europe, too, attracting customers looking for value for money. 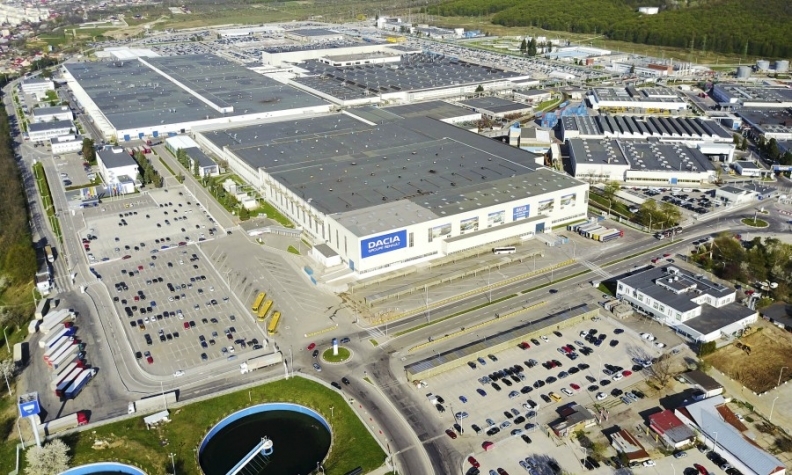 Although Renault paid "almost nothing" for Dacia, in Schweitzer's words, it has invested 2.8 billion euros in the brand since the purchase, including 2.2 billion to transform the vast manufacturing complex in Pitesti, north of Bucharest, into a modern automotive factory capable of building cars that meet both Western European standards and the needs of buyers in developing countries. The plant can churn out one car every 54 seconds, or 450,000 a year, as well as engines and other components for Renault Group factories in Europe and North Africa. A neighboring suppliers park with 1,500 tenants is anchored by Valeo and Faurecia. Inside, 800 robots -- including collaborative "cobots" -- work alongside some 12,000 employees. Renault and Dacia executives say the emphasis has been on improving perceived quality – fit and finish, or what buyers touch and feel. The 32-km test track at the Titu engineering center has a dust tunnel and sections meant to simulate wet, muddy and rutted roads that are found in many emerging economies where Dacias and Renault's other Global Access cars are sold. Plastic parts and paint are subjected to extreme heat and sunlight bench testing. Schweitzer's hunch that Dacia could be the base for a new, more international Renault has paid off. Last year, 49 percent of group sales were outside Europe, and Dacia now accounts for 19 percent of overall group sales. In 2017, Renault sold 1.4 million low-cost Global Access vehicles, the majority of them derivatives of the humble Dacia Logan. CEO Carlos Ghosn hopes to sell 2 million Global Access cars by 2022, with growth expected to stall in Europe and increase in developing and emerging markets such as Russia, Brazil, India and China. Future changes to Dacia's lineup include a redesign of the Lodgy minivan, a new Sandero likely based on Renault's coming fifth-generation Clio, and a Duster variant -- although a rumored seven-seat SUV was recently ruled out. Dacia may also find itself grappling with tighter European emissions standards coming in 2020-21 and beyond, because buyers may not be willing to pay for costly hybrid or full electric drivetrains. "We are open to all technologies, but it needs to make sense," said Marc Suss, head of Renault’s Global Access range. "Dacia is a very pragmatic and rational choice for customers, so if we can get the battery cost low enough and find enough fuel savings, we will do it."